If you are lucky enough to be one of those people who live in or near a city where there is a Ted’s Montana Grill, then you may already know how good the food is. Fabgrandpa and I have been to Ted’s several times now, and I can tell you first hand that no matter how many times you go, the food is going to be good each time. And, whether you take your family or friends out to dinner, or send them a gift card, Ted’s Montana Grill is an excellent choice for gifting during the holidays. During our last visit to Ted’s, we started our meal with Bison Nachos. These were on the Starters menu. We ordered them to share among the three of us at the table, but the plate is big enough to order as your meal. 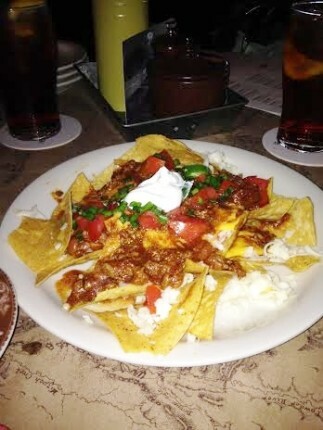 The Bison Nachos are a combination of bison chili, pepper jack cheese, and fresh toppings over tortilla chips. 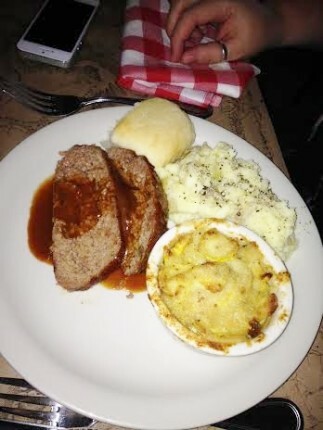 Fabgrandpa chose the meatloaf, again. He loves Ted’s Bison Meatloaf. His meal came with mashed potatoes, an individual Squash Casserole, and a roll. As with most other items on the menu, you can choose beef if you prefer. My choice for lunch was the Ted’s Bacon Cheeseburger. I chose the bison version, and asked for avocado to be added. Oh, my! What a delicious choice! I asked for roasted asparagus instead of fries with it. Gluten free buns are available upon request at Ted’s. 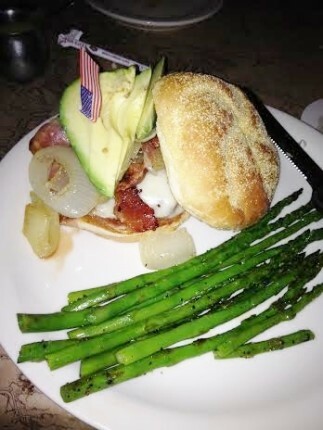 Ted’s Bacon Cheeseburger with avocado. I ordered roasted asparagus instead of fries. I wanted a salad to go with my burger. There are several salad options on the menu. 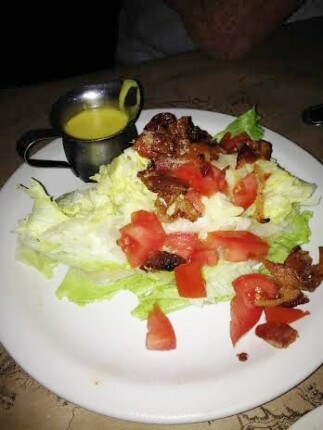 I chose the Wedge, which is made with a wedge of iceburg lettuce, bacon, and vine ripened tomatoes. 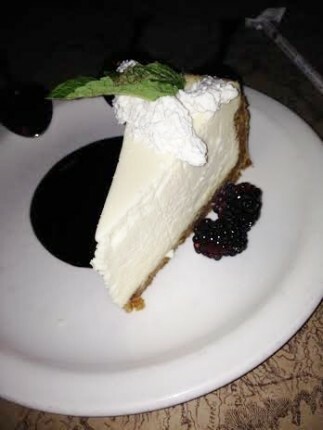 Finally, we ordered one slice of Wildberry Cheesecake to share. This cheesecake was so good! It had a berry sauce, and some whole blackberries as a garnish. Inspired by the pioneer spirit of the American West, Ted¹s Montana Grill is committed to serving traditional, honest food accompanied with genuine hospitality. The menu is known for its modern interpretation of American classics using fresh, hand-prepared ingredients and sustainable practices. Selections feature timeless recipes made with the finest cuts of bison, including high quality, flavorful steaks and award-winning burgers amongst a variety of other unique entrées. 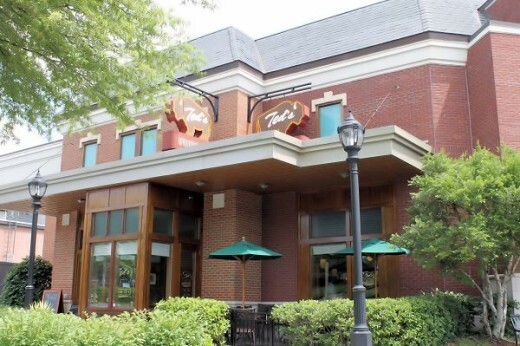 Headquartered in Atlanta, Ted¹s Montana Grill was co-founded in 2002 by Ted Turner, the media entrepreneur, environmentalist and philanthropist, and award-winning restaurateur, George W. McKerrow with the mission of re-introducing the bison to America¹s table. The company was named one of 20 emerging restaurant chain brands by Nation’s Restaurant News in 2013 and earned TripAdvisor’s Certificate of Excellence in 2013, 2014 and 2015. To learn more or find a restaurant, visit tedsmontanagrill.com, likeTed’s Montana Grill on Facebook and follow on Twitter. This year, Ted’s Montana Grill raised $303,303 through its partnership with No Kid Hungry, which is the equivalent of more than 3 million meals for children in need in America. Funds raised through the nonprofit’s Dine Out for No Kid Hungry initiative exceeded Ted’s Montana Grill’s 2015 fund-raising goal of $300,000. Dine Out for No Kid Hungry is the largest opportunity for the restaurant industry to unite in support of ending childhood hunger in the U.S. Ted’s Montana Grill guests could participate in the Dine Out fund-raiser August 31- October 4 at all 45 locations. Patrons who donated $5 or more received a $5 gift card to use at Ted¹s Montana Grill in the future. For every dollar donated, No Kid Hungry can provide 10 nutritious meals to a child in need. Ted’s Montana Grill has partnered with No Kid Hungry since 2008, raising a total of $834,680 to date, or 8.3 million meals for kids. Ted’s will be open for Thanksgiving Day. You can see the Thanksgiving menu here. The Thanksgiving Roast Turkey Feast includes side salad or cup of soup or chili, whole-roasted turkey and gravy with garlic mashed potatoes, herb dressing, buttered carrots, “Aunt Fannie’s“ squash casserole and cranberry sauce, and is served with their famous Apple Pecan Crisp. Take the whole family out for $25 a plate, and give Mom a break from cooking all day! I wished we had this restaurant in Missoula, Montana. The food looks wonderful.